Uber CEO Travis Kalanick tackled two of his company's biggest controversies on Thursday: It's treatment of drivers and its refusal to fingerprint. Kalanick sat down with Valerie Jarrett, senior adviser to President Obama, at the seventh annual Global Entrepreneurship Summit in Palo Alto, California. He was one of a number of successful startup founders who came to give advice to aspiring entrepreneurs. Airbnb's Brian Chesky, LinkedIn's Reid Hoffman and 23 and Me's Anne Wojcicki also spoke. Kalanick used to opportunity to talk about why Uber doesn't support fingerprinting. The ride-hailing company has been fighting to hire drivers without fingerprint-based background checks. The checks can be costly and slow, and impact the company's ability to constantly bring on new drivers. Uber and Lyft recently pulled out of Austin after the city voted to require fingerprinting, leaving thousands of drivers suddenly without a full or part time job. "Imagine a country where people might get arrested who shouldn't get arrested. Imagine if that country were the U.S.," said Kalanick. "We have systems in place where if you're arrested, you literally can't get work, even if you're found to be innocent. And it's unjust." He blamed the incumbent industries, like taxis, for pushing fingerprints as a way to protect their own interests. It's the kind of pushback a successful entrepreneur should expect. Uber has also been criticized and sued for the way it classifies its drivers. The company is currently in the middle of multiple lawsuits that challenge whether or not drivers are contractors like Uber claims, or employees. Being classified as an employee would give drivers a number of legal protections and also make them eligible for certain benefits like expense reimbursements. 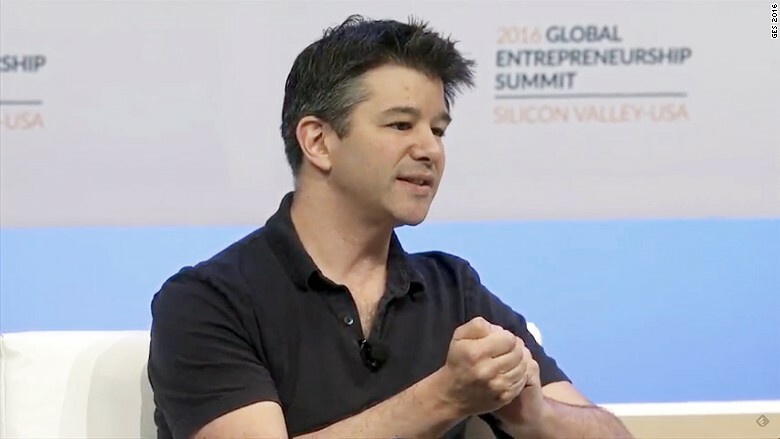 "The on-demand economy can also be quite interesting on the labor side of the equation," said Kalanick, when Jarrett asked how Uber was ensuring its worker's voices were being heard. The company has pushed back against unionization, but in May it did strike an agreement with a union in New York to create an "association" for drivers. He described it as a mechanism for driver justice and a way of getting feedback. "The old school version of the labor movement is one that's exclusive," said Kalanick. "Only some people get the benefit of being in a particular union, and it excludes others from participating ... The Uber version of the labor movement is it's inclusive, is that anybody can work." "I find that when you're an entrepreneur and you're in a place where you're disrupting an industry in a large way, well, it's going to be controversial. You're going to get lots of headlines," said Kalanick.